Everyone loves a good ‘comeback’ story, and few are as endearing and inspirational as the comeback by the inimitable singer/songwriter Neil Sedaka. From 1958 to 1963, Neil Sedaka was one of the biggest stars on the pop music scene, with seven Top 10 singles during that span, including “Calendar Girl,” which rose to #4 on the Billboard Hot 100, and #1 in Canada in 1961, and what many call his signature song, the original version of “Breaking Up is Hard to Do,” a huge worldwide hit that went to #1 for two weeks in the U.S.
Then came the emergence of Beatlemania in 1964, a phenomenon that dramatically changed the music scene around the world. The solo artists that dominated the charts in the late 50s and early 60s were suddenly obsolete, and Neil Sedaka’s career as a recording artist completely stalled. From 1964 to 1966, only three of Neil’s singles broke the Top 100, the highest charting song being “The World Through a Tear” that peaked at #76 in 1965. Neil continued to write, despite his lack of success as a recording artist, and penned hit singles that were successfully covered by other artists, such as “Working on a Groovy Thing,” that was a Top 40 R&B hit for Patti Drew in 1968, and a Top 20 pop hit for The 5th Dimension in 1969. In spite of the professional futility during the period that Neil called “the hungry years,” he maintained the admiration and respect of his fellow artists, including Elton John, who was one of Neil Sedaka’s biggest fans. The two met at a party in London in 1973, and Elton learned that Neil was essentially a free agent, with no record label deal. Poetically, Elton signed Neil to his Rocket Records label, and the seeds were planted for Neil Sedaka’s triumphant return. The 1974 album ‘Sedaka’s Back’ was aptly titled, as it marked Neil’s resurgence to the top of the pop charts. The album was a U.S. release of a collection of songs that had been recorded in the U.K., including “Laughter in the Rain,” the first single from the album that became the second #1 single of Neil Sedaka’s career, and, perhaps, his sweetest. Neil wrote the music, using a Pentatonic scale (all black keys), while Phil Cody wrote most of the lyrics for “Laughter in the Rain.” The tune also topped the Billboard Adult Contemporary chart for two weeks, as well as the Adult Contemporary chart in Canada, where it also went to #2 on the Canadian Top 40. “Laughter in the Rain” was a slow builder, taking more than four months to complete its journey to #1. It was a deeply gratifying accomplishment for Neil, especially because the single could have been over before it was even released. Neil tells the story of how he was driving in his car in New York City when he heard a version of “Laughter in the Rain” by Lea Roberts on the radio. Needless to say, Neil had a panic attack, since it was just two weeks before Rocket Records was going to release his version of the song, and the comeback that he so longed for could have hit an insurmountable roadblock. Neil pulled over immediately and called Elton, pleading for the label to release his version of “Laughter in the Rain” as soon as possible. Fortunately for Neil, the label rushed the release to American radio stations within a few days, and the disaster was averted. Predictably, Lea Roberts’s version faded into obscurity. 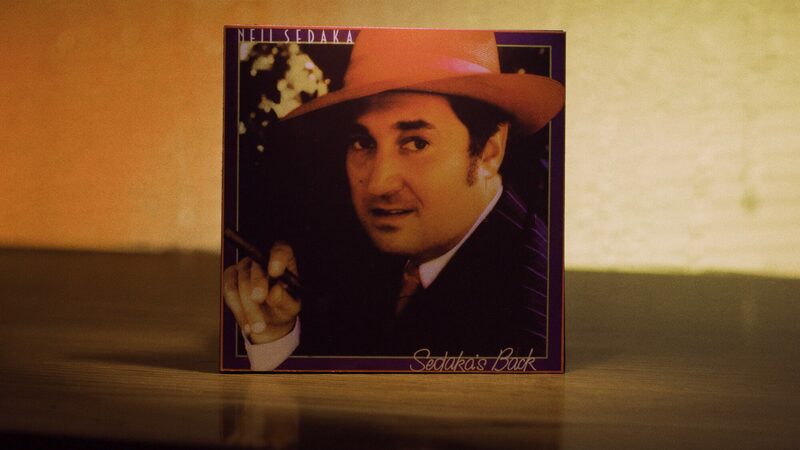 Sedaka’s Back reminded the music industry of Neil’s greatness that had been disregarded for nearly a decade and, perhaps most importantly, the album introduced Neil to a new generation of fans. Not only did the album produce a massive #1 single, but it also featured two additional Top 40 hits for Neil, “The Immigrant,” another Sedaka/Cody collaboration that went to #22 on the Billboard Hot 100, and “That’s When the Music Takes Me” that rose to #27. The depth of the album didn’t stop with Neil’s successful singles. It also featured a powerfully emotional Sedaka/ Cody ballad titled “Solitaire.” The Carpenters found “Solitaire” and recorded a version that went to #17 on the Billboard Hot 100, and #1 on the Billboard Adult Contemporary chart, but the crème de la crème was the Sedaka/Howard Greenfield co-written album track “Love Will Keep Us Together.” The husband and wife duo, Captain & Tennille, remade “Love Will Keep Us Together” in 1975, and their cover became a global smash, rising to #1 in Canada, Australia, and the U.S., where it finished as the top song on the Billboard Year-End chart for 1975, and the year’s best selling single. At the end of their version of “Love Will Keep Us Together,” you hear Toni Tennille, lead singer for Captain & Tennille, sing “Sedaka is back” during the fade-out, punctuating the amazing comeback of one of the rock era’s greatest artists, Neil Sedaka. Happy 80th birthday, Neil, from your millions of admirers. Thanks for persevering through the tough times and creating songs that the world will be singing forever. We love ya!